Sid Caesar died on February 12, at 91. From 1950 through 1954, he starred on NYC-TV’s Saturday evening Your Show of Shows. Previous variety programming relied heavily on vaudeville antecedents. A banana-peel laugh rioteer like Milton Berle performed broad slapshtick in the midst of an omnium gatherum of acrobats, animal acts, anemic tenors, and second string hoofers. Your Show of Shows had its share of stock variety material. But its enormous popularity stemmed from a comic vision with a scope and originality unprecedented in the medium. On any given Saturday night, one would howl through send-ups of marital woes in the ‘burbs; or foibles in the workplace; wicked parodies of bathetic reality weepfasts like This Is Your Life, or Italian neo-realist cinema; sidesplitting pantomimes and barmy monologues on anything or everything by a daft German professor. There was a dash of slapshtick bufoonery, too, raised to absurdist Dada-esque altitude. Your Show of Shows was ably produced by Max Liebman, but Caesar was always its presiding genius, master crafter and player in skits, monologues and pantomimes. The most famous of the latter was a frenetic one man, all parts depiction of a World War I aerial combat duel. He was supported by a cornucopia of comic talent. 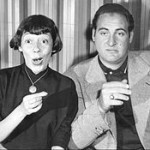 Notables in his madcap fellowship were the rubber-faced Imogene Coca and dimunitive Howard Morris. His writing stable included Carl Reiner (who also acted), Mel Brooks, Neil Simon, Woody Allen, and Larry Gelbardt. All went on to become legends in theater, film, and TV. Spurred by Caesar’s prodigious gifts, Your Show Of Shows provided the groundwork for Saturday Night Live, Annie Hall, Seinfeld, The Producers, and so much more. Incredibly, each show was assembled in several days with limited rehearsals and broadcast live. Caesar not only pleasured millions . . . he helped me get through a reasonably tormented adolescence. One recurring skit particularly echoed the plight of being placed in the middle of my parents’ endless skirmishing: Caesar would find himself haplessly sandwiched between a battling couple (Reiner/Coca) in a movie theater, restaurant, or some other public locale. The pair always ended up walking away hand in hand while Sid was left on the ground, dazed, his clothes in rags. It was my psyche rather than my wardrobe that often got shredded when I was elected parental peacemaker. Somehow I took perverse satisfaction in Caesar’s ability to endure every trashing by the gruesome twosome, and return next week for more – like the Road Runner’s tattered coyote. In high school I was a earnest lonely nerd – mocked by jocks, ego savaged by unrequited love for girls to whom I hadn’t spoken a word. Tutored by Caesar and his literary counterparts, I became the class clown; acknowledged—even admired—when my shenanigans got me tossed out of class and into detention. I skipped my senior year; went directly to college at 16 on a Ford Foundation scholarship. Unfortunately the well-meaning experiment made no provision for planful mixing the klatch of immature “Fordies” with older students as well as Korean War vets. Once more I had become the dorky outsider. No wonder that I instantly identified with the gang of Animal House misfits I stumbled upon in the office of Jester, Columbia’s humor magazine. I honed my writing skills as I rose through Jester’s rowdy ranks, eventually becoming its editor. Back in the day, that position could have launched a career in print journalism or in Hollywood. But I had become smitten with psychoanalysis – hadn’t Freud authored a terrific joke book? – and opted for medical school and psychiatry instead. Subsequently I’ve blended practice with journalism. My speciality remains adolescent therapy. One needs considerable humor to withstand pubescent sturm und drang. 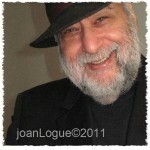 Mutatis mutandis, many kids learned to deal with their angst by acquiring an ironic perspective in their work with me. I haven’t written humor per se for years. The market for it has become terribly slim. But I hope my work in the “applied analysis” of cinema, media, and popular culture has not lacked wit. I’ve also been able to fight off my own occasional blues by re-viewing Sid and his merry crew on YouTube. Caesar himself wasn’t so lucky. 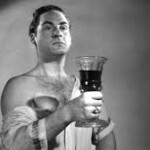 The audiences who savored his wit didn’t know that by his supremely successful 30s, he had become an infuriating self-loathing drunk and pill addict. His afflictions over several decades after Your Show of Shows crippled, then nearly destroyed, his career. His devoted wife of many years and his 3 children suffered for him and from him. A prolonged Freudian analysis in the 50s was monumentally ineffective. Caesar’s fame, even as it declined, as well as his formidable denial made him avoid AA. Hospitalization dried him out, but relapses predictably followed. Several therapists did better than their orthodox predecessors, but he never really let them reach him. As far as one can determine, his drug regimen for a mood disorder (which possibly fueled his addictions) was hair of the dog, along with whatever sedative comprised the flavor of the day. Caesar hit rock-bottom in the late 70s when he realized he was a few steps from suicide. So he traveled alone to his beloved Paris—presumably to take a relatively small role in a Peter Sellers movie, but really to heal himself through his own loopy version of gestalt therapy. He took a room at a quiet hotel where he tape recorded and listened to himself – actually himselves – for hours and sometime days at a time. “Sick” Sidney debated “healthy” Sid for both their souls. His autobiography* samples those dialogues, profoundly moving – are often funny as anything he ever did on Your Show of Shows. Caesar’s idiosyncratic self-analysis freed him from substance abuse and stilled his personal demons. He became a health and fitness addict, lived an infinitely happier life for 35 more years. He performed nearly until the end, ever the consummate, reliable pro. But, poignantly, his work somehow never attained the xenith of wit he achieved on Your Show Of Shows. Much print has been put to paper about the relationship between art and madness, between comedic talent and affective illness. Why the gift of great mirth so often co-exists with ravaging anguish in many comic geniuses remains a vexing question. Was the euthymic Caesar unable to reach the dizzy heights of the hypomanic Caesar? Or had years of addiction so bruised his brain as to simply rob him of his powers?